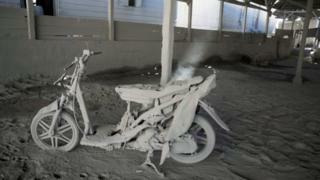 A thick layer of ash has covered several villages in Indonesia after the eruption of Mount Sinabung on Sumatra island. At least seven people died after clouds of hot ash and gas consumed farmland around the mountain on Sunday. The ash reached towns 12km (seven miles) away, local military head Agustatius Sitepu told AFP, including Gamber village in North Sumatra. Even though the eruptions have subsided since Sunday, residents are still being warned to stay away from the 2,460m (8,070 foot) volcano, which is among the country's most active. "We urge the people surrounding Mount Sinabung to keep away from the red zones, which are within a three kilometre radius from the crater, or within a four kilometre radius from the equator in the north to northeast sector, or a six to seven kilometre in the south and southeast sector," said local official Muhammad Nuril Ansori. Sinabung had been dormant for 400 years when it began erupting again in 2010. More than a dozen people were killed in a particularly fierce eruption in 2014, the same year that residents were ordered to evacuate. However, some have since returned to their farms. Indonesia, located on the Pacific Ring of Fire, has more than 120 active volcanoes.